The stop shot is the most powerful shot in pool. It's the foundation of the break, position play, and - for the purposes of our next two lessons - safety play. The principle of these safeties shown below is obvious: You want to stop the cue ball behind a blocker ball and send the object ball to an unattainable location. The distance you need to send the object ball will in part determine the speed of the shot, and you'll adjust your draw (i.e., bottom English, or backspin), if any, on the cue ball to get the stop effect. Let's practice stopping the cue ball from several distances. Take a look at the diagram, Ex. 1. Focus on hitting the object ball squarely and stopping the cue ball on impact. Typically, you're stroking the cue ball so that it's sliding (no forward roll or backspin) on impact. Try it from all three cue ball positions (A, B and C). From each distance, you can adjust your speed and draw to get the stop effect. In general, as your speed increases, you need to decrease the amount of draw (i.e., hit closer to center), or else risk drawing the cue ball backward. Try practicing each distance with different speeds, and see where you need to strike the cue ball. 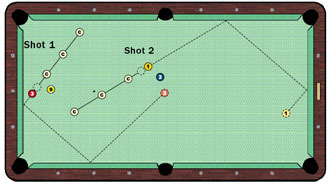 Then try Shots 1 and 2 (other diagram) from the three different cue-ball locations. Again, your speed will be determined by how far you want to send the object ball. Adjust your draw accordingly. Next month, we'll look at hitting the object ball slightly off-center, so the cue ball can travel to more troublesome locations.